Have you ever thought about an unexpected present which is great for health and well being? 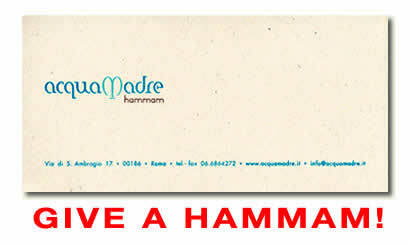 For anniversaries, birthdays or on any special occasion Give a Hammam. 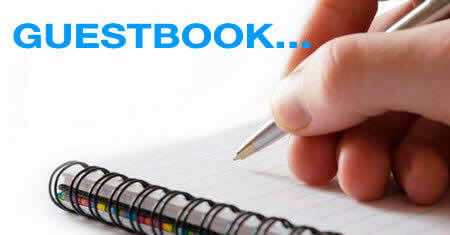 We can provide personalized vouchers to meet any requirement. 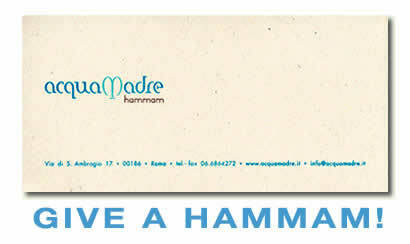 The vouchers bought at our location (in Via di S. Ambrogio, 17 Roma) can be freely given to others, have no expiration date and can be converted to other Hammam services. 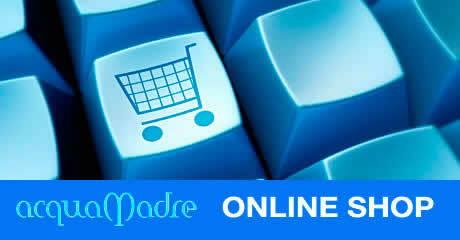 The vouchers bought online expire after 12 months. A special place for special occasions. Acquamadre is the ideal location to celebrate special dates. Hen parties, bachelor parties (always with Acquamadre special gift), graduations, anniversaries and any other important occasion. Acquamadre pays particular attention to these special dates, organizing a unique event in a unique location for the well being of you and your loved ones.